I was talking to a relatively new friend the other day. Lady Gaga came up in conversation. I didn't do the bringing up, by the way. My answer, and granted, I had not had breakfast yet, was, "yeah, I don't do Lady Gaga, so I don't know. Here, look at my playlists." I do not care for Lady Gaga's kind of music. In all candor, I find it unfocused, simplistic, and, all in all, a good example of a one trick pony. Her sound is not the kind that oozes inspiration to me. I very much doubt I'll have a great writing idea by listening to "Poker Face". However, play some Doors or Led Zeppelin and, voila, heavens' choirs descend upon the living room and I can write. Rock n' roll can and does inspire. When done right and when relying mostly on music itself rather than odd stage shenanigans and bizarre costumes. But I can appreciate that many like Gaga's music and as the high-frequency adage points out, de gustibus non est disputandum. And what about those outfits? Could someone explain to me why her getups qualify as art? I've followed the aesthetics of high fashion for years. I read up on it daily for a few minutes. I read as much as I can on the academic text of fashion but nowhere do I find any trace of Gaga that makes sense. Some call it high art. Hmm. Maybe there is something about high art that I am completely missing. I very much doubt it but it could be true. But I don't think I can be serious about music without researching the über-popular music of the time. And that I did. I have looked at Gaga's album Fame. I've looked at the music videos. And, nope, I still don't get it. I played her album at the gym and while her "Bad Romance" track helped me keep my pace as I was running 7.0 on the treadmill. After a few minutes I felt my face twitching which apparently happens when something either vexes or annoys me. I slowed down and picked Postal Service to finish my run. It worked better that way. The thing is, if one is truly interested in music, one is bound to have some element of Gaga penetrate one's area of music focus. My Rolling Stone magazine came in the mail this week and I actually thought to myself, 'I bet there's more stuff in there praising the talent that is Gaga.' I want artists to do well as I was born a lover of art. However, I just don't see the point of overexposing a performer to the point of saturation. Or, more importantly, to the point of ignoring other solid artists. I understand how supply and demand works and that if the people want Gaga, then Gaga shall they have. But, how can we know what other music is out there if it does not get any attention? Music awareness has much to do with visibility and the less visible an artist, the harder it is for music lovers to know about him/her. Granted, not all are lucky to have the kind of sociality that allows them to get informed re: new music. I am very lucky in this regard. My musician friends play a huge role in my music education as I get countless texts, emails, conversations informing me of new music. However, I also do much research on new music. I read all the relevant music publications, read the twitter feeds, and discuss new music with my in-the-know friends. I have to do my homework, too. Music, to me, is no laughing matter. It's not a hobby or a luxury but rather a necessity. Music informs all I do in life as only a small number of hours a week are spent sans music. But back to the premise of this post. Aesthetics may exacerbate one's talent but it's not a substitute for talent. I somehow doubt Beethoven lost any sleep over his wardrobe the night before a show. I am not saying Gaga is devoid of talent. She writes music and she certainly knows how to be relevant or rather how to sell relevance. But to me she makes sense in an off-Broadway type of production where Burlesque is the theme du jour. Some like burlesque but if you don't, you won't have to face it every time you want to read up on new art and performances. And what's with the overuse of the term 'genius.' Surely, not everyone can be a genius. Genius is another word that gets misused in the vernacular. A good, albeit general text to consult re: the concept of 'genius' might be the following book, The Genius in All of Us: Why Everything We've Been Told About Genetics, Talent, and IQ Is Wrong by David Shenk. So, as I enjoy the new Spring sun while leafing through the new Rolling Stone magazine that has Shaun White on it, I think of our collective, shifting values in music. What's hot in music is transient and perhaps that's a good thing. It keeps all artists on their toes. It forces them to check their own cultural relevance constantly. And human genius rarely moves faster than the collective tastes of music lovers. Well, unless it's Beethoven or Verdi and it's been a while since we had artists like that. 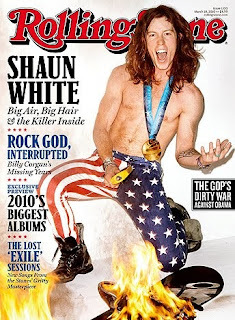 And, in conclusion, do read the new Rolling Stone cover article on Shaun White, the über-talented snowboarder and skater. Among other things, he is a lover of old G'nR, Led Zeppelin, and good ol' rock. Another reason to like well well, I suppose. When you say, "I think of our collective, shifting values in music. What's hot in music is transient and perhaps that's a good thing. It keeps all artists on their toes. It forces them to check their own cultural relevance constantly. And human genius rarely moves faster than the collective tastes of music lovers." ...what do you attribute the shifts in musical tastes? I do think that certain kinds of music can only make sense in a certain cultural atmosphere. Like, Gaga's music would not have a place to thrive during the grunge period or even during the rebirth of alt rock. Also when you say that, "human genius rarely moves faster than the collective tastes of music lovers"
are you saying that mediocrity gives birth to actual innovation in music? By the way, the reason why I pay attention to Gaga at times is because her weird 'getups' make me laugh. Good comic relief. What makes me make sense of Gaga's popularity is the fact that she's such a representation of 'neophilia' of which you've also spoken before. "Music awareness has much to do with visibility..." I agree with this. That's why supporting the more marginal artists is important in bringing more players to the forefront. "[music is] not a hobby or a luxury but rather a necessity." sometimes i've wished it wasn't such a necessity for me, but it always has been and likely always will be. how it is appreciated and executed changes over time, but i've come to accept that it is a major part of who i am. ps. i've yet to listen to any lady gaga, although i keep thinking i probably should, if only for pop culture education. I was thinking about this today again and it basically boils down to attention. We all wants our own chosen artists to do well and when they don not get to be in the spotlight, their future creativity suffers, too. Music, to me, is also a necessity. At times I see my mood suffering if I don't have new music I'm looking forward, btw. I find her annoying personally. Both musically and aesthetically.